The world’s most eco-friendly country that has everything to offer from rafting through the forests to zip-lining over canopy trees, hiking through waterfalls and relaxing on stunning sandy white beaches. You can also see the turtle migration if you go at the right time. Unwind from the stresses of everyday life and relax in the beautiful Manuel Antonio with its white sandy beaches. Day 1 Hola, Costa Rica! Now that we’ve arrived at Juan Santa Maria International Airport in San Jose, a Wild Guanabana rep will be waiting outside the airport gates to take us to our hotel. The rest of the day can be spent recovering from the long flight or exploring the lively city of San Jose. Forget cars and busses – we’re rafting our way to the Arenal Volcano Area this morning after breakfast. We’re getting picked up from our San Jose hotel and transferred to Rio Balsa where we’ll get a briefing and safety check before paddling our way down Costa Rica’s best rivers for two hours! On the other side of the river is a delicious spread of fresh, tropical fruits waiting for us to devour before heading off to our river house for an exclusive, homemade buffet lunch. We should get to our Arenal Volcano hotel by 4 PM, and the rest of the evening is free for us to explore this artisanal town. 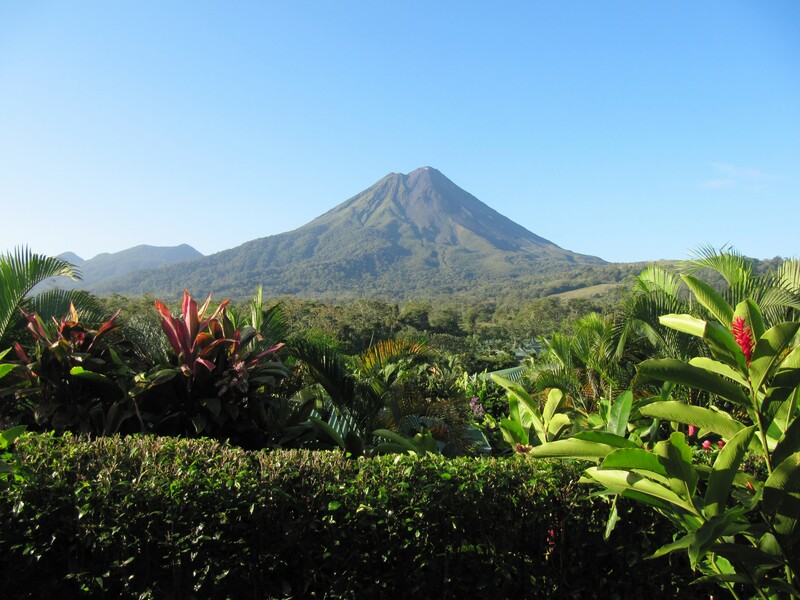 Today we’re off on a day tour that includes a hike through a rainforest with a naturalist guide to the base of the Arenal Volcano where we’ll catch a beautiful sunset at the observation point. Later, prepare for a swim in a relaxing pool of natural and hot spring water before being transferred back to the hotel. Today we discover one of Costa Rica's hidden mysteries, Rio Celeste (Celeste River). We’re hiking rainforest trails for approximately four hours – or over 7 km – and visiting places like the Lagoon in Los Tenideros, where two brooks meet to form a heavenly turquoise lagoon with thermal mud-filled cavities in the ground. We can also take soothing warm baths at Tenorio natural springs before finishing our hike down at the Rio Celeste waterfall. Once this day tour is finished, we’ll be transferred back to the hotel. This morning we’ll be picked up from our hotel in Arenal and shuttled to Monteverde – a small town in the Puntarenas Province famous for its cloud forest and numerous other reserves – where we’ll spend the day freely enjoying the many sights it has to offer. After breakfast we’re being shuttled to our hotel in Manuel Antonio, a beach area with one of the most impressive landscapes in the world. We’ve got two days to explore its coves and white sandy beaches, or relax and take in the backdrop of lush foliage amidst great mountains and forests that reach the beaches. If you’re a certified diver, we can talk about diving options! Our driver will pick us up this morning from our hotel in Manuel Antonio and transfer us back to the Juan Santa Maria International Airport in time for our flights back home. All vehicle transfers as mentioned above. International flights to/from Costa Rica. Meals not included in the itinerary.